New fine art inkjet print (giclée print) of St Paul's Cathedral in London. This intricate illustration was originally illustrated in my London studio, and was created for the book 'The Buildings That Made London.' Each print is hand-signed by the artist. The line 'Artwork by Josie Shenoy created for The Buildings That Made London published by Bloomsbury Publishing and based on original material from The National Archives, London' sits at the bottom of the paper in fine print. Digitally printed with pigment based inks on slightly textured 310 gsm fine art paper, to achieve superior archival quality. The giclée print is the closest possible match to the original work resulting in a painterly, soft image with a classy, decorative feel. Mount/frame not included. Product Dimensions A4: 210 x 297 mm | A3: 297 x 420 mm Shipping UK: A4 Prints £4 | A3 Prints £5 UK orders: since this is a new print, expected delivery of this item is 2-3 weeks. If you need your item sooner please contact Josie to discuss a rush fee. For international delivery, please see my delivery information and overseas prices here. More delivery info can be found here. Free Tailored Message I can add a hand written message free of charge to accompany your art print. At the checkout you will be given the option to add a message written by me, or simply request a blank gift card for you to write. A short dedication with the recipients name can also be added in pencil at the bottom of the print itself if this is requested when ordering (no extra charge.) Feel free to ask me about this via email. New fine art inkjet print (giclée print) of Tower Bridge in London. This intricate illustration was originally illustrated in my London studio, and was created for the book 'The Buildings That Made London.' Each print is hand-signed by the artist. The line 'Artwork by Josie Shenoy created for The Buildings That Made London published by Bloomsbury Publishing and based on original material from The National Archives, London' sits at the bottom of the paper in fine print. Digitally printed with pigment based inks on slightly textured 310 gsm fine art paper, to achieve superior archival quality. The giclée print is the closest possible match to the original work resulting in a painterly, soft image with a classy, decorative feel. 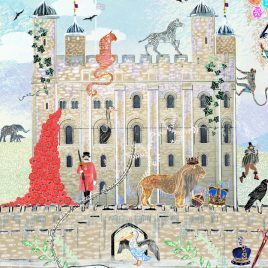 New fine art inkjet print (giclée print) of the Tower of London. 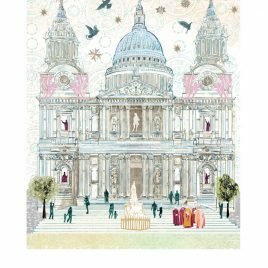 This intricate illustration was originally illustrated in my London studio, and was created for the book 'The Buildings That Made London.' Each print is hand-signed by the artist. The line 'Artwork by Josie Shenoy created for The Buildings That Made London published by Bloomsbury Publishing and based on original material from The National Archives, London' sits at the bottom of the paper in fine print. Digitally printed with pigment based inks on slightly textured 310 gsm fine art paper, to achieve superior archival quality. The giclée print is the closest possible match to the original work resulting in a painterly, soft image with a classy, decorative feel. New fine art inkjet print (giclée print) of the Victoria & Albert Museum in London. 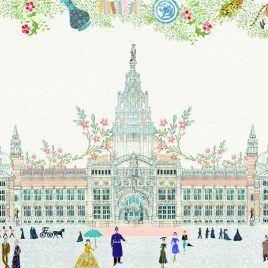 This intricate illustration was originally illustrated in my London studio, and was created for the book 'The Buildings That Made London.' Each print is hand-signed by the artist. The line 'Artwork by Josie Shenoy created for The Buildings That Made London published by Bloomsbury Publishing and based on original material from The National Archives, London' sits at the bottom of the paper in fine print. Digitally printed with pigment based inks on slightly textured 310 gsm fine art paper, to achieve superior archival quality. The giclée print is the closest possible match to the original work resulting in a painterly, soft image with a classy, decorative feel. New fine art inkjet print (giclée print) of the city of Amsterdam. This intricate illustration was originally drawn by hand in my London studio. Each print is hand-signed by the artist. Digitally printed with pigment based inks on slightly textured 310 gsm fine art paper, to achieve superior archival quality. The giclée print is the closest possible match to the original work resulting in a painterly, soft image with a classy, decorative feel. This hand-drawn typographic map was originally created using my signature multi-layered approach, fusing traditional pencil drawing and print-making with digital processes. Inspired by my love of pattern, cities and their stories. Mount/frame not included. Product Dimensions A4: 210 x 297 mm | A3: 297 x 420 mm Shipping UK: A4 Prints £4 | A3 Prints £5 UK orders: since this is a new print, expected delivery of this item is 2-3 weeks. If you need your item sooner please contact Josie to discuss a rush fee. For international delivery, please see my delivery information and overseas prices here. More delivery info can be found here. Free Tailored Message I can add a hand written message free of charge to accompany your art print. Simply add a product to your basket and at the checkout you will be given the option to add a message written by me, in a special gift card. Need something even more special? A short dedication with the recipients name can also be added in pencil at the bottom of the print itself if this is requested in advance. Feel free to ask me about this via email. 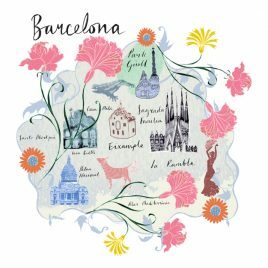 New fine art inkjet print (giclée print) of the city of Barcelona. This intricate illustration was originally drawn by hand in my London studio. Each print is hand-signed by the artist. Digitally printed with pigment based inks on slightly textured 310 gsm fine art paper, to achieve superior archival quality. The giclée print is the closest possible match to the original work resulting in a painterly, soft image with a classy, decorative feel. This hand-drawn typographic map was originally created using my signature multi-layered approach, fusing traditional pencil drawing and print-making with digital processes. Inspired by my love of pattern, cities and their stories. New fine art inkjet print (giclée print) of the city of Copenhagen. This intricate illustration was originally drawn by hand in my London studio. Each print is hand-signed by the artist. Digitally printed with pigment based inks on slightly textured 310 gsm fine art paper, to achieve superior archival quality. The giclée print is the closest possible match to the original work resulting in a painterly, soft image with a classy, decorative feel. This hand-drawn typographic map was originally created using my signature multi-layered approach, fusing traditional pencil drawing and print-making with digital processes. Inspired by my love of pattern, cities and their stories. 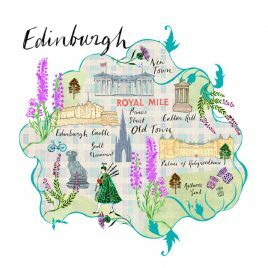 New fine art inkjet print (giclée print) of the city of Edinburgh. This intricate illustration was originally drawn by hand in my London studio. Each print is hand-signed by the artist. Digitally printed with pigment based inks on slightly textured 310 gsm fine art paper, to achieve superior archival quality. The giclée print is the closest possible match to the original work resulting in a painterly, soft image with a classy, decorative feel. This hand-drawn typographic map was originally created using my signature multi-layered approach, fusing traditional pencil drawing and print-making with digital processes. Inspired by my love of pattern, cities and their stories. New fine art inkjet print (giclée print) of the city of Glasgow. This intricate illustration was originally drawn by hand in my London studio. Each print is hand-signed by the artist. Digitally printed with pigment based inks on slightly textured 310 gsm fine art paper, to achieve superior archival quality. The giclée print is the closest possible match to the original work resulting in a painterly, soft image with a classy, decorative feel. This hand-drawn typographic map was originally created using my signature multi-layered approach, fusing traditional pencil drawing and print-making with digital processes. Inspired by my love of pattern, cities and their stories. 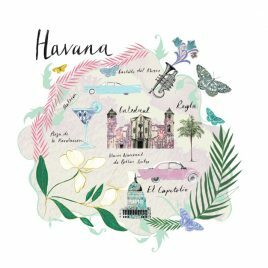 New fine art inkjet print (giclée print) of the city of Havana. This intricate illustration was originally drawn by hand in my London studio. Each print is hand-signed by the artist. Digitally printed with pigment based inks on slightly textured 310 gsm fine art paper, to achieve superior archival quality. The giclée print is the closest possible match to the original work resulting in a painterly, soft image with a classy, decorative feel. This hand-drawn typographic map was originally created using my signature multi-layered approach, fusing traditional pencil drawing and print-making with digital processes. Inspired by my love of pattern, cities and their stories. New fine art inkjet print (giclée print) of the city of London. This intricate illustration was originally drawn by hand in my London studio. Each print is hand-signed by the artist. Digitally printed with pigment based inks on slightly textured 310 gsm fine art paper, to achieve superior archival quality. The giclée print is the closest possible match to the original work resulting in a painterly, soft image with a classy, decorative feel. This hand-drawn typographic map was originally created using my signature multi-layered approach, fusing traditional pencil drawing and print-making with digital processes. Inspired by my love of pattern, cities and their stories. 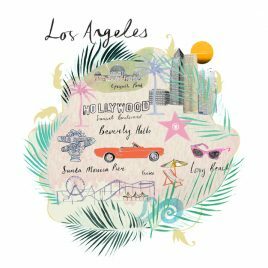 New fine art inkjet print (giclée print) of the city of Los Angeles. This intricate illustration was originally drawn by hand in my London studio. Each print is hand-signed by the artist. Digitally printed with pigment based inks on slightly textured 310 gsm fine art paper, to achieve superior archival quality. The giclée print is the closest possible match to the original work resulting in a painterly, soft image with a classy, decorative feel. This hand-drawn typographic map was originally created using my signature multi-layered approach, fusing traditional pencil drawing and print-making with digital processes. Inspired by my love of pattern, cities and their stories.